Google Hotel Ads. Not an unknown term, right? But not so familiar either. While the hotel industry is adopting new trends of technology to grow their business, Google Hotel Ads comes as a blessing in disguise. Now, we’re sure you’d like to know more about the whole kit and caboodle around the Google Hotel Ads commission program, and what role does it play in growing your business and boosting your revenue. Let’s start with the basics. What is Google Hotel Ads? Well, Google Hotel Ads is a powerful tool that allows you to showcase your hotel on Google when one searches for a hotel on the search engine. With the help of Google Hotel Ads, your guests can see the complete information of a hotel such as; pricing, availability, amenities, reviews and such likes. These ads also come with a “Book a room” button which helps travelers book directly with a hotel right from the search results. Hotel ads help you track each stage of your guest’s trip planning process. No matter what device they use and how they search, these ads will get your property seen at the right time, by the right people. Though, you should keep in mind that you need to work with Google’s Integration Partner to get started with your Google Hotel Ads campaign. And eZee is Authorized Hotel Ads Integration Partner with Google. To avoid the rising commission fees of the OTAs and to increase direct bookings from their hotel website, Google Hotel Ads is the most effective tool for hoteliers. This powerful tool can provide your brand the much-needed opportunity to be visible in front of millions out there and capture their attention during the buying process journey. What benefits does Google Hotel Ads bring for you? In Google Hotel Ads, you can choose either of the two options for a commission. i.e. Cost Per Click (CPC) model or Cost Per Acquisition (CPA) model. In the CPC model, you pay Google the commission when one clicks on the “Book a room” button. And in the CPA model, you need to pay commission to Google only on confirmed bookings you get on your hotel website. In either case, there are very rare chances of bookings becoming no-show or getting canceled; which leads to your increase in confirmed bookings and reduces your loss of revenue. Whenever the guests search for the hotels – Google helps visitors by providing all the useful information about hotels. This information allows the guests to select and book the hotel according to their choice. Google Hotel Ads help hoteliers increase direct traffic to the hotel website that leads to more direct bookings as well. This is the most effectual way to increase direct bookings for those who don’t want to depend on OTAs. The direct traffic not only improves a hotel’s visibility but also builds brand loyalty among the guests, that is helpful in cultivating long-term relationships. Not only from the desktop, but the guests can also book hotel rooms directly from their smartphones. With the availability to book on Google, the hoteliers will get the opportunity to attract your visitors’ eyes right after they search to book hotel rooms on Google. Also, the booking process gets easier for the guests as they can see all the required information right on the search engine. Google leads them to the booking engine from where visitors can book with the hotel. Hence, Google Hotel Ads helps hotels and guests with quick bookings. The best result of utilizing Google Hotel Ads is that with a low commission, hotels will be able to acquire quality guests. Because those interested in booking with you will only go ahead and click on the button. By using the right kind of responsive booking engine, highlighted information of amenities and other details; you’re bound to get more direct bookings through Google Hotel Ads. Google knows what travelers want, and in the future, these demands are only going to increase. Hence, Google updates required details on the search engine page as per the demand. Check out – How Hilton Worldwide drives higher ROI with Google Hotel Ads. As the Google Hotel Ads commission program increases the chances of direct bookings, it means you’ll be getting important statistics and information about the guest’s travel planning process. Besides this, it also reduces intermediaries between the guests and your property. So you can directly interact with your guests, know their demands, predict and attract future guests, and strengthen your loyalty programs for the existing bookings. Google Hotel Ads does half the work for you. It displays all the expected information in the search engine and in case any guest clicks on the Ad – it means that they’re almost convinced and interested in booking a room with your hotel. Besides, Google charges a lower commission than the OTAs, which decreases your expense in the form of commissions. Hence, Google Hotel Ads equally contributes to increasing your hotel business revenue. Find out how Premier Inn got 40% more bookings from new customers with Google Hotel Ads. Now, what you need to do to make Google help you with conversions and beat the competition? Google My Business is a free listing that optimizes all your information and brings it to one place in the search results under your business name. It makes you and your hotel website found on Google making it easy for you to attract travelers. Nowadays, hotel reviews and reputation play a vital role for your business. Most of the guests take the final decision on the basis of your star ratings and reviews on Google and different sites like Booking.com, TripAdvisor and such likes. These reviews are curated from various sources across the internet and are surfaced within your Google My Business Listing. Therefore, to stay on top, it is important to manage your reviews, and most importantly, use a hotel reputation management software to control your online reputation in a streamlined way. Rate parity issue can be a common problem and you can see the low conversion rates when the rates are not in line with the competition. Hence, to ensure that the campaign is not negatively impacted by the rate issues, it is important to regularly monitor rate parity. A hotel channel manager, in this case, helps you maintain rate parity across all the channels you’re connected to. How is the commission charged in Google Hotel Ads? Google offers 2 commission (payment) options to hotels who enroll in the Google Hotel Ads commission program. Pay-Per-Click: In Hotel Ads Center, all you need to do is set a price you’re willing to pay for every click on your ad and define a budget. Your hotel’s rank or position will be based on how much you’re willing to spend on clicks. Commission: You only need to pay when the guests book directly from your hotel booking engine directed from your Google Business Listing (i.e. When an actual reservation is made via Google). So, do you want to seize this opportunity? Hoteliers, don’t you want to take the advantage of this powerful tool – Google Hotel Ads that provides you a way to hike your hotel revenue? Today, most of the hotels want to be independent and therefore they’re frequently looking to get more direct bookings at a low commission. This tool is best suited for your hotel business needs to drive traffic and bookings to your hotel’s website. eZee being an authorized Google Hotel Ads integration partner becomes the best choice for you in this case. Get started with your Google Hotel Ads campaign through us! 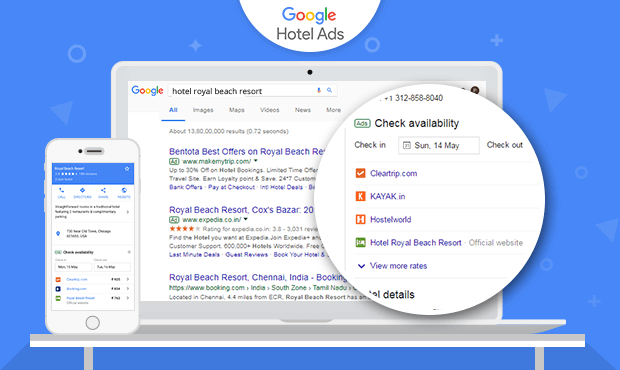 Grab Direct Bookings with Google Hotel Ads!